Heartburn, also known as acid reflux, is a burning sensation in the chest, just behind the breastbone or just below the breastbone. The sensation of pain or discomfort often rises in the chest and may radiate to the neck, throat, or angle of the jaw. The sensation gets worse on lying down or bending over. Chronic heartburn is called gastroesophageal reflux disease (GERD). GERD is a relatively new classification of chronic heartburn (less than 10 yrs) which seems to have appeared at the same time as two new classifications of drugs H-2-receptor blockers and Proton pump inhibitors which were stronger and provided longer relief than similar antacids. However all three mentioned drug classifications by different mechanisms stop the production of stomach acid; stomach acid which we need in order to not only digest food but help us absorb essential nutrients like Calcium and Vitamin B12. Now one of the possible causes of heartburn or acid reflux is a hiatal hernia. When one part of the internal body pushes into another part where it should not be, it is called a hernia. The hiatus is an a opening in the diaphragm muscle that allows for the passage of the esophagus as it attaches to the stomach and the passage of the aorta, the inferior vena cava and nerves. See http://en.wikipedia.org/wiki/Diaphragm_%28anatomy%29 and observe the way the diaphragm muscle is constructed. There are muscle fibers that wrap around both sides of the esophagus. 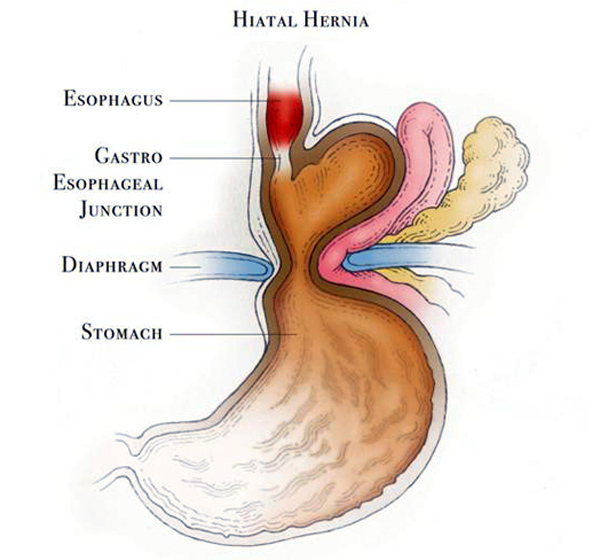 A hiatal hernia is when due to diaphragm weakness, the stomach slips upward through the hiatus into the space where the esophagus is causing both nerve irritation and slippage of stomach acid into the esophagus causing the sensation of heartburn or GERD. As an applied kinesiologist, we work the neuro-lymphatics and neuro-vascular points to increase blood and lymph flow for these organs. I would also look for a possible fixation (not a subluxation) of the lower thoracic vertebrate. Besides the diaphragm, the psoas muscle is important to check as its fibers blend with the fibers of the posterior diaphragm. The muscles of the chest and the abdomen are also important to check if the patient is constantly in a flexed position. As an applied kinesiologist, I check to see which muscles are weak or hypertonic. As a neurokinetic therapist, I look to see if the muscles of the posterior thoracic (mid back) are inhibited by the muscles of the anterior chest or abdomen . The cranial system is checked for involvement of the parasympathetic (vagus nerve). Acupoints for the stomach, and lung may be checked for involvement. We would gently after these procedures try to gently manipulate the movement of the stomach back into its proper place and then strengthen the diaphragm muscles; give breathing exercises for the patient to do at home to stop the hernia from happening again are included as well as nutrients like zinc, l-glutamine to heal any micro-erosions in the GI wall, digestive enzymes to restore the function of the stomach and supplements like Vitamin B12 and calcium that have not been absorbed due to medications. Here are some medical research studies on the adverse effects of proton pump inhibitors which are routinely prescribed for heartburn/acid reflux/GERD. This entry was posted in !0011Applied Kinesiologist, 10011 Chiropractor, 10011 neuro kinetic therapy, Applied kinesiology, calcuim, chelsea applied kinesiologist, Chelsea chiropractor, chinese meridian energy, chiropractic, cranial sacral, cranial sacral therapy, digestive problems, Dr. Vittoria Repetto, https://drvittoriarepetto.wordpress.com, hypochlorhydria, magnesium, muscle testing, neuro-lymphatics, neuro-vascular, NY Spirit, NYC, NYC Applied kinesiologist, NYC chiropractor, zinc and tagged 10011 applied kinesiologist, 10011 chiropractor, 10011 neuro kinetic therapy, 10013 chiropractor, 4-5 cervical, 5-9th thoracic, acid reflux, acupoints, antacids, aol.com, applied kinesiologist, Applied kinesiology, applied kinesiology practitioner, best applied kinesiologist, best chiropractor, chelsea applied kinesiologist, chelsea chiropractor, chelsea neuro kinetic therapy, chiropractic, cranial nerves, cranial sacral, Digestive health, digestive problems, downtown NY chiropractor, downtown nyc applied kinesiologist, Dr. Vittoria Repetto, facebook, Gerd, google.com, H-2 receptor blockers, heartburn, http://www.facebook.com/pages/London-Terrace-Chiropractic-Applied-Kinesiology/109622855768202, london terrace chiropractic, london terrace chiropractic & applied kinesiology, manhattan neuro kinetic therapist, msn.com, muscle testing, neuro-lymphatics, neuro-vascular, NYC, NYC Applied kinesiologist, nyc neuro kinetic therapy, phrenic nerve, proton pump inhibitors, west Broadway Chiropractic, Wordpress, www.bing.com, www.drvittoriarepetto.com, www.drvittoriarepetto.meta-ehealth.com, www.drvittoriarepetto.wordpress.com, www.twitter.com/drvrepetto, www.westbroadwaychiropractic.com, yahoo.com. Bookmark the permalink.